Price reduced!!! Now at $270/sf, this is a great value. Sellers are motivated- make an offer!! 7 Pitt Street is a wonderful opportunity to own an historic home in the great Harleston Village neighborhood. 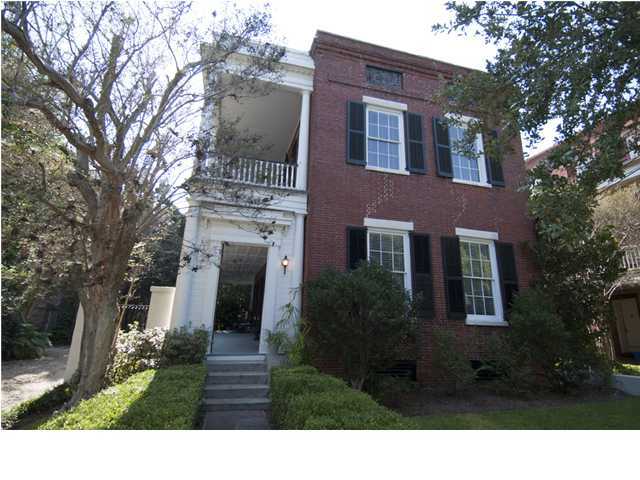 The home epitomizes historic Charleston with its beautiful brick exterior and large double side porches. It is a wonderful home on a quiet block. This brick Charleston single house is low maintenance and convenient to everything… walk two blocks to Colonial Lake, or to many of Charleston’s wonderful dining options, or to the great shopping on King St. The home is characterized by its stately brick, double piazzas, high ceilings (11+’), gorgeous wood floors, beautiful moldings and trim, and original black marble mantles. The home has been restored and accentuates these architectural features that are so characteristic of historic Charleston and period craftsmanship. The master suite features a very spacious bedroom and tremendous updated bathroom complete with walk-in closet, dual vanities, extensive marble, and its own fireplace. The home is subject to a horizontal property regime as the rear of the property has been subdivided. The driveway is a shared common element. There is NO regime fee and this offering has 2 designated off street parking spaces.